A bit more about the Hanttula.com website, its purpose, history, and place in the larger world. What shortcuts provide in efficiency, they rob in experience. The Hanttula.com website is the online presentation of creative work from Michael Hanttula. Yes — it’s a website. You click on parts, you view things, you experience feelings and, ideally, have new thoughts. You are not meant to be entertained or delighted; you are meant to reconsider most of what you know of the world and your place in it. Yes — it’s a website. But, like all good & important things in our awareness, it’s more about what you bring to it and what you take from it than what it has to offer on its own. You click on parts & you view things. Hopefully, you enjoy the process. Gah! The “About” page! The “About” section of the “About” page! Aren’t these the worst? THE. WORST?! Often, yes. Why? Because they are b-o-r-i-n-g. So boring. Sites are meant to be experienced; to be used & explored. Don’t read about it — just go have a look! Spend some time & find something out. But – you came here for SOME reason and that reason should be satisfied. With that in mind, this page will try to meet your ‘About’-seeking needs. A nearly complete yet read-ably short history? CHECK. With animated GIFs from the mid-90s? CHE-E-E-E-E-CK! The various exhibits & projects throughout the site carry their own artist statements, when appropriate. The nature of the Internet as a medium does often require the absence of such statements from the works themselves. In several cases, there is a performative decision to not include a statement within the work’s space. Academic institutions, scholars, and presenting galleries are free to contact Hanttula regarding individual artist statements that are not supplied on this site. 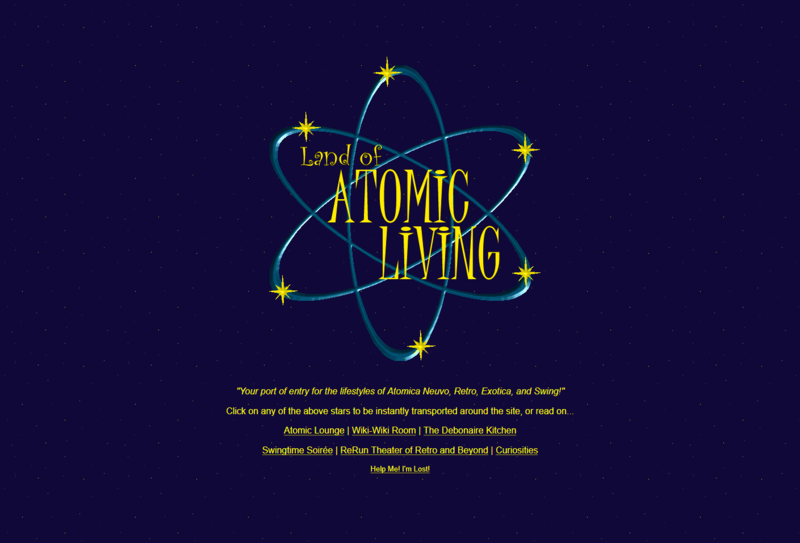 Before Hanttula.com (before unique domain names were even much of a thing), the online project that is now this site was known as The Land of Atomic Living — an online guide to the mid-nineties resurgence of mid-century interests. Focused almost exclusively on detailing and cataloging classic cocktails, lounge music, swing dancing, and tiki, it was also a descent into mild madness. By 1995 standards, it was glorious. Ultimately, it was short-lived. From that foundation, though, the Hanttula.com project was born. Initial versions of Hanttula.com were a platform for the early exhibits — starting with the famous Museum of Food Anomalies, the simplistic Inside the Magic 8-Ball, the regrettable Circus of Disemboweled Plush Toys, the interactive Video Confessional portraits project, and the mysterious Museum of Lint). These early days also saw the launch of a manually-edited “news” box and ushered in the first days of micro-blogging (5-6 years before Twitter made 140 character posts a thing). As the site grew, it became increasingly visual in its display. There were short-lived attempts at building it into an early multi-media platform – housing early Internet video works, photography and more. YouTube was still about 4-5 years away and video on the Internet was… not great. 2001 also saw the rise of the YOUR HOME FOR INTERNET FUN™ era — the tagline that came to typify the nature of the art work that the site would house. The years between 2001-2008 saw one of the greatest expansions of the Hanttula site and its content. New styles were developed, new designs released, and new exhibits premiered. During the earlier years of this phase, the infamous (and just properly one-time famous) Bunnyocalypse: The Marshmallow Bunny Apocalypse was created and The LOST Notebook was released. The “Unmitigated Brilliant Magnificence” tagline emerged in 2009 (replacing “Your Home for Internet Fun™“) and accompanied a complete rebuild of the site’s design and platform. This new build allowed for the newer-era work of using the Internet as a medium and supplied the architecture for a number of Internet projects based outside of the Hanttula.com domain. During this period, the Museum of Food Anomalies grew and new, popular exhibits were introduced. Namely, the (now ‘classic’ edition of the) B-Movie Title Generator and the Tiki Bar Name Generator. The Hanttula Events Calendar and Hanttula Mystery Objects projects were early forays into merging online & real world experiences. Side note: “Unmitigated Brilliant Magnificence” isn’t just a tagline. After the 2009 rebuild and the release of a few additional exhibits, the available time to tend to Hanttula.com diminished. In the following years, there were several, slow attempts at updating the site, but there was never enough time to see any one approach through to release. In 2016, a more concerted effort to rebuild the site started. Using available time in early mornings, late nights, or on slow weekends, an entirely new version of Hanttula.com was ever-so-slowly coming to life. This new approach required almost every existing Hanttula project to be rebuilt from near scratch. Even projects that were essentially “mothballed” had to be updated and rebuilt to work within the new platform. Hanttula.com would not be possible without the work, input, and efforts of many others. The following list represents just a few of the individuals & organizations that make this kind of work possible. The mid-2000s era posts of The DistractoMatic (a predecessor to the MicroZine) was additionally populated by a few Hanttula.com authors (D.Ball, Gymbeaux, and Gish). D.Ball, in particular, found & shared some incredible Internet content and was a legend of the era. The site’s content management is powered by the phenomenal WordPress. More than just a CMS, WordPress represents some of the best of what the Internet can be — made by many, shared freely, and improving our worlds of communication, expression, and creativity. Our customized installation of WordPress also utilizes a number of fantastic plugins, including: Gravity Forms, Advanced Custom Fields Pro, WooCommerce, Akismet (reduction of SPAM comments), Yoast SEO, and more. That was a lot of ‘About’-ing on this About page, no? Yes. Yes? No, but yes. OK. Time to have a look around the site. May we suggest that you start at THE BEGINNING…?